Today marks the 68th anniversary of Jackie Robinson breaking the major leagues color barrier. 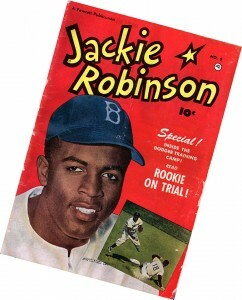 Robinson on April 15, 1947 made his debut with the Brooklyn Dodgers, playing first base and going 0-3 with a run scored. He batted .297 that season to take Rookie of the Year honors. Robinson’s iconic No. 42, retired throughout baseball, will be worn by every major league player today, and the Los Angeles Dodgers will host the Seattle Mariners for tonight’s Civil Rights Game. Jackie’s widow, Rachel Robinson, and Hall of Fame southpaw Sandy Koufax are expected to participate in the first-pitch ceremony.